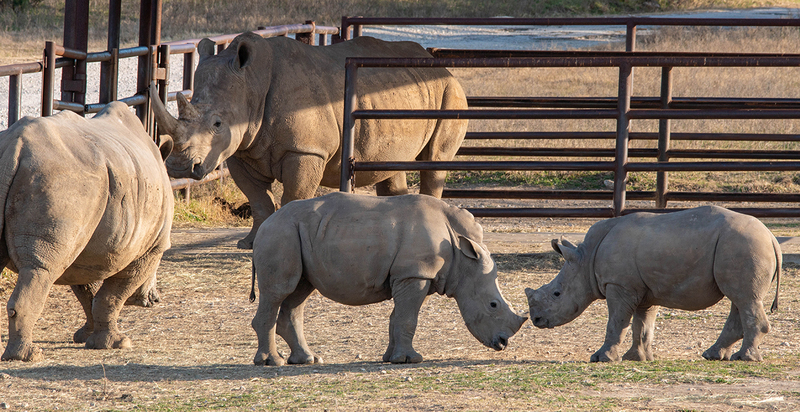 Our southern white rhino calves “Xena” and “Blake” are living together, alongside their mothers, in the smaller yard adjacent to our main White Rhino Yard! You can learn more about them on a Safari Tour, which is available daily. You can call for reservations at 254.897.2960 from 8 a.m. to 5 p.m.
Is the baby rino male or female. Are you able to purchase a Rhino as a pet if I have the correct living conditions. A coworker told me it depends on U.S. Fish & Wildlife guidelines in your area. We don’t sell our animals as pets though, so that’s not our area of expertise. Fossil Rim is a 1,800-acre wildlife preserve that is home to 1,100 rare and endangered animals that roam free in natural habitats. Started in the 19 as a collection of exotic animals, Fossil Rim s focus has evolved into a mission for conservation of endangered animals, some on the brink of extinction. Primary importance is placed on the protection and proliferation of these fragile species; their successful breeding programs mean it s not unusual to see baby animals throughout the preserve. Can we let the rhinos or feed the rhinos? Hello Courtney, no to rhino feeding or petting. On very special occasions, some people get to pet them. Potentially on an Adventure Tour, but it is pretty expensive. If you’ve seen photos of rhino petting on our social media, it was probably from Dream Day – an event we do for local families who have experienced a recent tragedy.